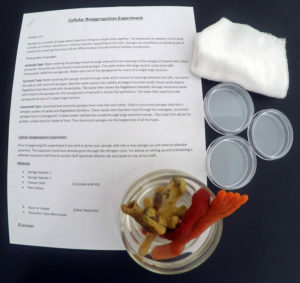 Experiment Kits come with live specimens and supplies need to perform educational and fun labs. Kits come with main components need for experiments. Other equipment may be needed such as saltwater aquarium for housing of marine life. With proper care specimens can be kept and reused for future labs. If you are not familiar with the set up and care of a marine aquarium or have other questions about kits ask for advice when you call to place your order. Sponges are a colony of single celled organisms living in one body together. This experiment helps to illustrate for students characteristics of sponges. Separate sponge cells from their spicules, watch them form clumps and over time start to grow into a new sponge! 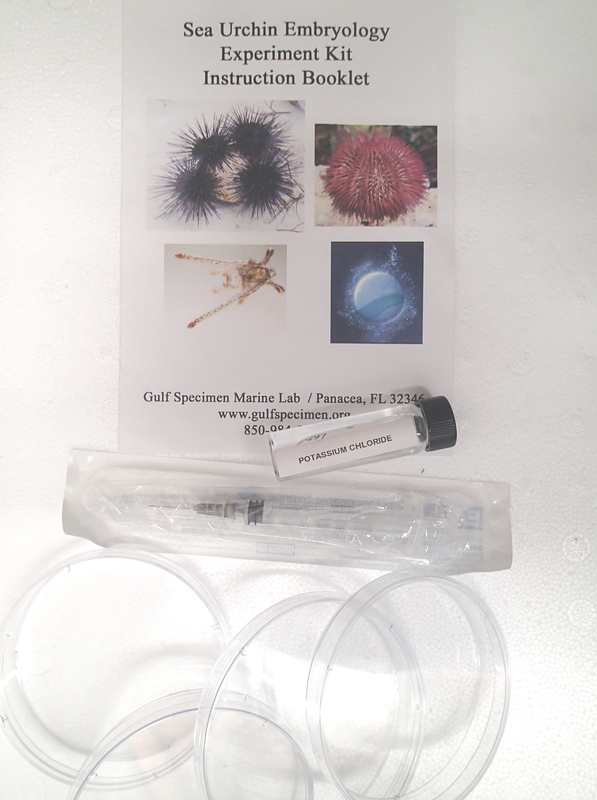 Our sea urchin species are excellent for embryology research and labs to teach students about the stages of development. 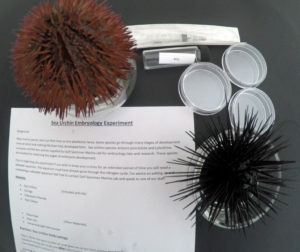 Injecting the urchins with potassium chloride causes muscle contraction. Urchins then release their gametes. Fertilize eggs with sperm and watch as they develop. Within 24 to 36 hours they will be a free swimming pluteus larva. Set up the lab in increments so students can view all stages of development at once. Observe comb jellies from the phylum Ctenophora, Parchment worms and soft coral sea pansies as they flash with bioluminescence when disturbed. Teach students about the mechanisms behind bioluminescence and different species throughout nature that display this amazing characteristic. Use a mini black light to show fluorescence in lapshell species and baby horseshoe crabs. This exciting kit will not fail to hold your students attention!